[ARCHIVED THREAD] - Photoshop Guru's I need some advice. I've got some pics taken from a wax museum. The problem is that the wax statues have some flash glare on them that make them look fake. It is mostly on thier cheeks. If I could take this glare off, the people would look real. What would be the best way of doing this in PS? can you post one of them? "I'm sorry. Yes, energy field good!" Notice how the glare take away the realistic flesh tones? I want these to look real!! Thanks for the help. What version of PS do you have? CS has a great tool for this...healing brush. I got a PSCS book and tweaked my avatar, like it better? eta: I only did JFK. Yep, I'm using CS. I'll play with that a bit. Thanks. Nevermind Photoshopping, but the Jacki Kennedy looks dead on. I'm just wondering who the guy to her right is supposed to be... it doesn't look anything like JFK. (assuming that's who it's supposed to be). I was thinking the same thing . If You Dont Win You Lose........You dont Loose! 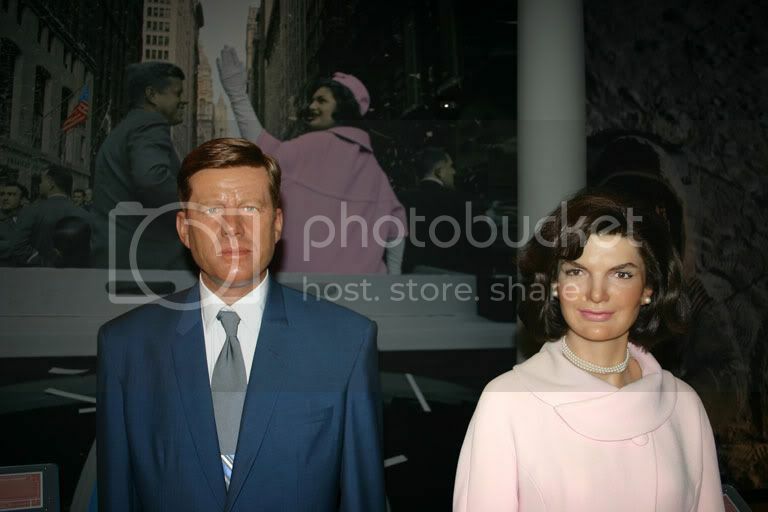 Whats Robert Redford doing posing in a wax museum with jackie? It's LOSE L-O-S-E Not LOOSE for crying out loud! I prefer to use Ulead Photoimpact rather than Photoshop. The basics are pretty much the same... a little blur, smudge and burn. And I guess that is Robert Redford standing with Jacki. That was my first though. That or Brightness/Contrast and isolate to highlights only. Photography & Photoshopping is a better place for a thread like this.